The world's second-largest economy become the top oil importer in April. The key reason? China is taking advantage of cheap oil to boost its strategic reserves. "They've been building out strategic storage. The goal is to build out to about 500 million barrels, compared to the U.S. capacity of 700 million to 800 million barrels," said Jeff Brown of Singapore-based energy consultants FGE. Brown said that while the numbers are a little murky, China has already built out about 150 million barrels of extra storage, with more capacity planned through the end of the year. "They take a lot of pride in buying oil when it's cheap," he said. Despite the massive capacity boom, China is still buying more oil than it can store -- and all that crude has to go somewhere. The solution lies in the Strait of Malacca. At anchor just a few kilometers off the coast of Malaysia lies the TI Europe, brimming with about 3 million barrels of oil destined for China. This 440,000 tonne monster is the world's biggest tanker. 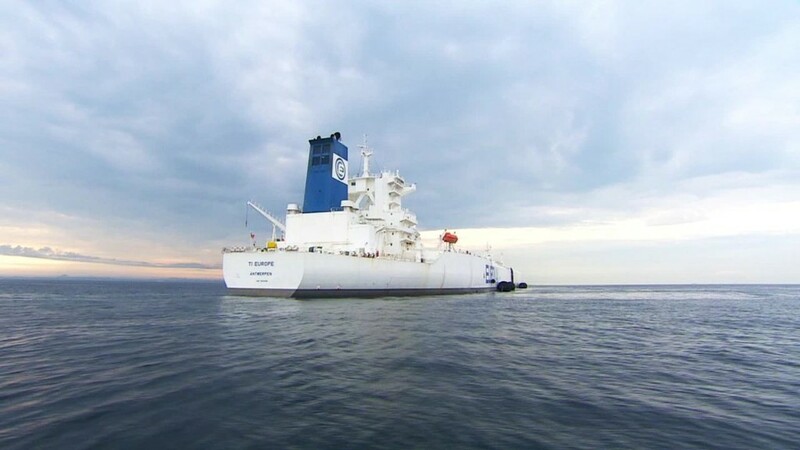 She has been leased by the China's state owned oil company at an estimated cost of $40,000 a day, to store oil until it can be shipped to China in smaller vessels. And she's not the only one. Oil tanker analyst Richard Matthews of Gibson Shipbroking in the U.K. says there has been a surge in the number of supertankers being leased for storage. "Normally, excluding Iranian ships, you might see only two or three ships storing, and they could be supporting offshore projects," he said. "Now there are up to 17 or 18 non-Iranian tankers." Supertankers can also be used to store oil in a market where the future price of crude is expected to be significantly higher than the current price. Speculators buy cheap, bear the huge cost of storage and finance, and still make a profit when they sell a few months later. But analysts say that, for now, the difference between the current and future price is not wide enough to rake in speculative profits, which points to China filling its boats. China could also turn to land facilities for storage, mainly in South Africa. But the Strait of Malacca has an advantageous location, situated halfway between the big oil producers and the Chinese mainland. Even as China builds out and fills it strategic oil reserves, consumers continue to gobble up fuel. Much of the demand comes from motorists, who are in the middle of a love affair with gas-guzzling SUVs. In the first three months of the year, sales of SUVs soared an eye-watering 48% in China over last year. Neil Beveridge, senior oil analyst at Sanford C. Bernstein in Hong Kong, said that oil consumption in China has remained steady at around 10 million barrels a day over the past few months, despite slower economic growth of nearly 7%. The good news for Chinese drivers is that the price of oil shouldn't rise much higher. In fact, it is more likely to fall, at least in the short term. "We think the market is way oversupplied right now," said FGE's Brown. "We expect in the next few months a big pullback and oil could drop below $50 a barrel again."